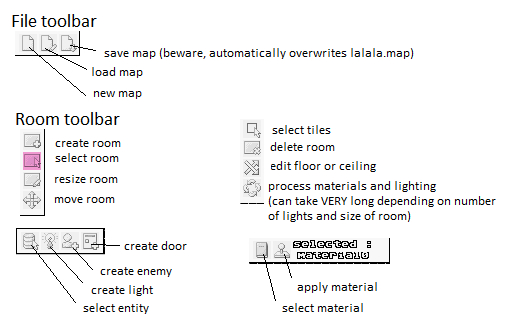 The current version is functional but not quite complete as a few features are missing from the editor itself (the material editor mostly) and a whole lot of the engine's features are only partly implemented. Nethertheless, I was able to use the editor this morning to in only a few hours create ACOTSYE. An updated to the engine was released. "ALSO, it's been brought to my attention that I forgot a few things made in a hurry specifically for ACOTSYE in the main engine code. Because of this, right now the spawn point has been moved to (-7,6) instead of (0,0) (which is indicated by a 0 on the grid) and the game will automatically end if there are no enemies in game." The update had been packed with all required files and mirrored here. If you only need the update, and do not wish to grab the full set of files, then you can find the update at the following link.